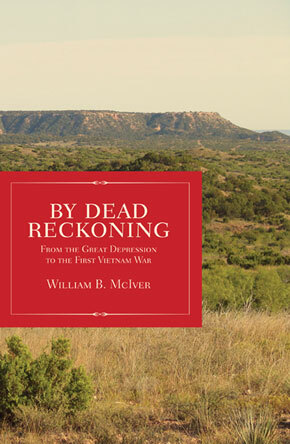 y Dead Reckoning began as a family history for Bill McIver’s children and grandchildren. But the story morphed from genealogy to historical autobiography as the author researched the westward migration of his 18th century immigrant Scot forbearers and wrote about the profound events of his early life that included the Great Depression, World War II, Korean War and First Vietnam War. The author’s search for his roots and the elusive basis for the family’s notion that “there was something special about being a McIver,” led him to tracing his Scottish ancestors from their arrival in colonial North Carolina, to slaveholding decades in Georgia and Alabama, to soldiering for the Confederacy, to Methodist ministries in Texas. Through personal stories, family characterizations and vignettes of history makers, we follow the McIver clan as they navigated, seemingly by dead reckoning, from Scotland to Texas. The proud McIvers contrasted sharply with the Arkansas hillbilly Lewises on the author’s maternal side. The Lewises were starved out of the Ozarks and forced into the Great Depression’s destitute army of millions. Although the McIvers were hit hard by the Depression, they were farmers and ranchers with lands that provided a living and patriarchs with vocations that sustained the family’s respectability. The Lewises, on the other hand, scratched out livings as day laborers. They took government handouts, lived in hobo camp tents and suffered the humiliation of losing their independent, backwoods way of life. During the first ten years of the author’s life, his parents were itinerant farm workers. He joined them in the cotton fields when he was old enough to pull a cotton sack. Despite the WWII economic upswing, his parents and the Lewises did not ride the post war wave of prosperity. Desperate to escape poverty, the author quit school at age seventeen and joined the Navy at the outbreak of the Korean War in 1950. As a common sailor, he enjoyed Far East fleshpots, pulled war duty during the naval blockade of North Korea and stood war-ready watches aboard a destroyer in Vietnam’s Gulf of Tonkin protecting aircraft carriers awaiting orders to launch combat missions in defense of beleaguered French forces at Dien Bien Phu in the highlands of Vietnam. By Dead Reckoning is a quintessential story of impoverished, Depression-era Americans who fought to rise from poverty and attain the blessings of the American Dream.